Today more and more readers are choosing to buy digital comics, myself included. In fact, I only buy digital collections these days, which I love reading on my iPad. I buy my digital comics through my friendly local brick-and-mortar comics stories’ ComiXology portal so I’m at least supporting them a little. There is a downside to only buying collections (digital or physical), and that’s the fact that you’re not supporting the series as its individual issues come out. This can be a real bummer when you read something you really like, only to discover that it’s been cancelled due to low sales (e.g. my sad experience with The Unstoppable Wasp). Today’s article is going to be short, but hopefully intriguing. 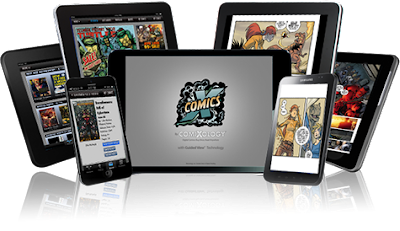 I like to daydream about new business models, and I think there’s an opportunity for ComiXology (the leading purveyor of digital comics and an Amazon company) to address this dynamic and make more money for comic book publishers while appealing to buyers like me. I figure they have the money and smarts to do whatever I want them to do. The way it would work is like this: A customer subscribes to a series (perhaps after reading a discounted first issue). When a collection comes out, they have the option to convert their single issues into the collection, losing access to the single issues but gaining access to the collection. If the collection is more expensive, the customer is charged the difference. If the collection is cheaper than the individual issues that have already been purchased, the customer is awarded store credit. You could even do this with a series that is already well under way. For example, if I wanted to subscribe to Amazing Spider-Man, I’d be given the opportunity to immediately to purchase all of the current issues going back to the first issue after the last collection. Then the subscription would proceed like normal, and when the next collection came out, I would be given the opportunity to convert my single issues into that collection as described above. I think it would be a win-win situation. The reader gets to stay current on the series they enjoy while knowing they’ll have the opportunity to convert those single issues into the next collection if they prefer to collect in collections as I do. The comic book companies get the reliable month-to-month sales that subscribers bring to the table. Granted, the downside for the publishers would be they lose out on the chance to sell both single issues and collections, but I doubt there are that many consumers who are in fact buying both regularly. And this scheme might even get more readers to try more series, which would ultimately be a good thing.